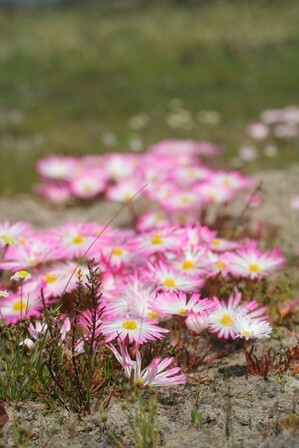 Dorotheanthus clavatus (Haw.) Struck, Dorotheanthus gramineus (Haw.) Schwantes forma albus (Haw.) 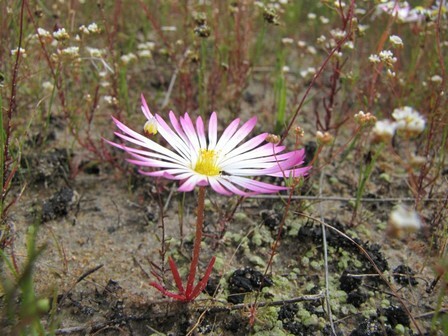 G.D.Rowley, Dorotheanthus gramineus (Haw.) Schwantes forma roseus (Haw.) G.D.Rowley, Dorotheanthus tricolor (Willd.) 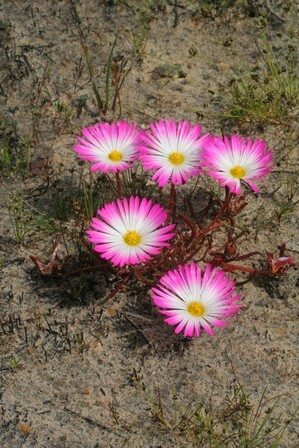 L.Bolus, Mesembryanthemum clavatum Haw. EOO 1855 km², only three of 10 known locations remain after most of this species' habitat has been transformed by crop cultivation and urban expansion. 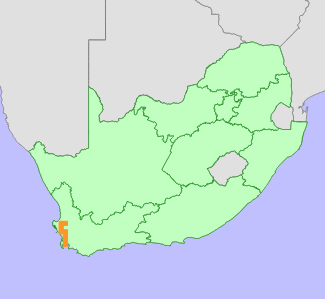 Decline is continuing due to alien plant invasion and expanding agriculture. Klak, C. and Bruyns, P.V. 2012. Phylogeny of the Dorotheantheae (Aizoaceae), a tribe of succulent annuals. Taxon 61(2):293-307.